This one's famous. It's also, if not necessarily jaw droppingly amazing, pretty good fun. With a lot of variety... from the melodious Latin-flavoured easy-pop of 'Main Shair To Nahin', via Punjabi poet/singer Narendra Chanchal's traditional (and excellent) 'Beshak Mandir Masjid Todo', to the manic, bass-laden cabaret number 'Ae Phansa' - as good as that gets without the usually unbeatable combination of Asha singing and Helen performing (I think it's Aruna Irani doing the honours here; I quite like her). 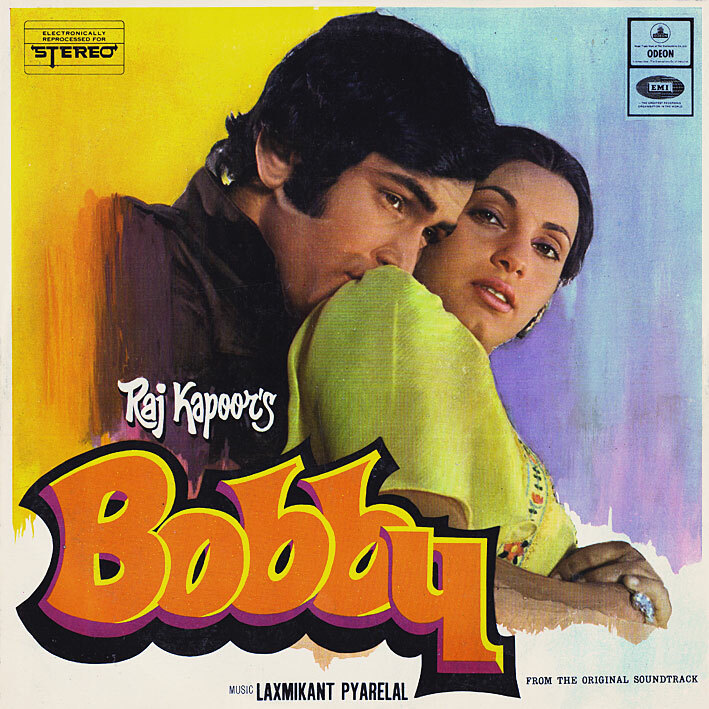 Many of you will of course be aware of the highly revered and much sought after instrumental LP 'Soul Of Bobby' - on which Laxmikant Pyarelal took the film's background music and transformed it into two side-long suites. That one is jaw droppingly amazing! And I'd post it if I had it, but I don't (VERY high up on my want list though) - head instead over to Eastern Eye for some tasty tasters. PS. This just in: Yet another 'Bobby' version here, again courtesy of Parties, Sarees & Melodies. I love ur posts man. keep it up! Thanks once again! You are always awesome. Had this LP forever and I love it to death. First i want to apologize to the webmaster of this page. I've downloaded so many song of this page and never said THANK YOU! Sorry, sorry, so much sorry. I am a Dutchman married to a hindu woman from Surinam (South America). So loves the older movie songs very much and so do i. Because of het i learned to listen to Bollywoodmusic. Thank you for giving us so much pleasure and keep up the goodwork. hi, great blog and great database of informations ! as a 60's 70's bollywood afficionado, i often download rips from this blog and if you want, i have the "soul of bobby" lp in perfect condition ( plus hundred others filmi LP's ) and i can rip it for you if you want to post it here ( or just for your listening pleasure !) . PC!!! DUDEEE ... Love this one ...... well i hav been download a lot lately !! Thanks a zillion tonnes man! Thanks for the great posts brother. I picked this one up in a junk store - I wish it had been Soul of bobby though. Is this record worth much ? I picked up about 15 records all mint condition. Apparently I missed this one, any chance for a reup? Thx! No reups unfortunately. It might not be gone though, could be Sharebee are simply having temporary problems; they often do.